PPL Park is a purpose built 18,500 capacity soccer stadium located in Chester, Pennsylvania. 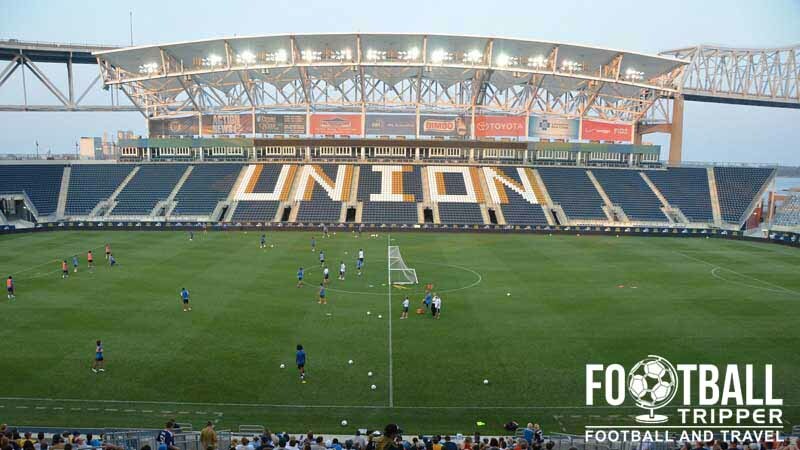 Home to the Major League Soccer Side Philadelphia Union. Conceptualised by Rossetti Architects who’s reputation amongst U.S sport fans is growing after designing four purpose-built soccer stadiums including Red Bull Arena, Toyota Park and Rio Tinto Stadium, Philadelphia Union’s PPL Park is the latest state-of-the art ground to emerge from Major League Soccer. Costing at the time, an estimated $120 million dollars, the new sports arena was the result of investment from both public and private enterprise. Delaware County contributed $30 million into the project, and the stadium’s sponsors and namesake, PPL EnergyPlus, investing the rest of the remaining funds. Initially planned to open in time for the start of the 2010 MLS season, the Eagles were forced to postpone their original plans after suffering delays in construction. Although not the end of the world as they rented Lincoln Financial Field, it would have been a great bit of history to coincide the club’s first league fixture with the unveiling of the new stadium. 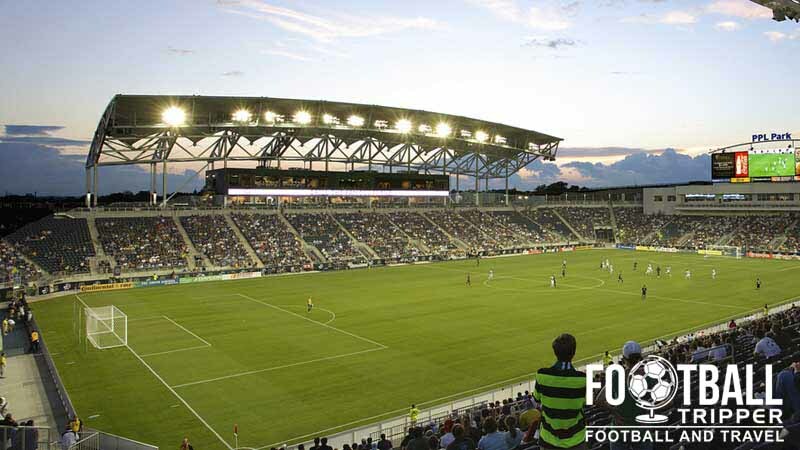 The inaugural fixture came on the 27th June 2010 a few months later than projected, although Philadelphia Union made up for it by christening their new ground in style with a 3-1 defeat of Seattle Sounders. The highest profile match to be played at PPL Park to was against Chelsea F.C in the 2012 MLS All-Star Game which attracted an attendance of 19,236. Following on from consistently high crowds since opening, there has been much speculation that The Eagles could expand the stadium as interest in Soccer blossoms. Plans suggest that this could occur in three stages resulting in a capacity of 30,000 which would make PPL Park the largest soccer ground in the country, ahead of L.A Galaxy’s StubHub Stadium. 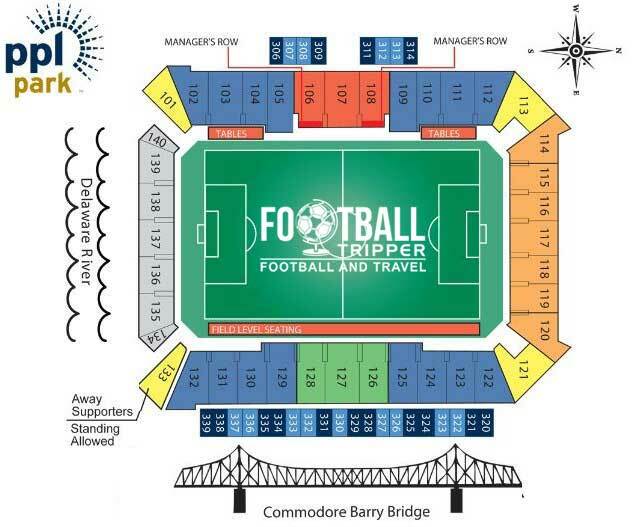 PPL Park Stadium is comprised of four stands: North, East, South and West. Whilst Philadelphia Union have may have extensive list of Partner pubs throughout the city, there aren’t actually many located within the immediate vicinity of the stadium. The closest options are west of PPL Park on West 2nd street and are all unassuming little pubs. Close to Blue Island train station there is the likes of Hayes Lounge and Bill’s Tavern – neither of which are “official” partners of the Union. Within the concessions area there a handful of kiosks known as the Snake and Shield which sell alcoholic beverages. Mostly beer, the brands in stock are usually Blue Moon, Corona, Stella Artois, Sierra Nevada and Red Bridge which is gluten free. In total there are fifteen concession stands and twenty-five smaller kiosks selling food and drink once inside the gate. The food is provided by Ovations who “dynamically rotate seasonal menus with the freshest, locally sourced ingredients”, at least for the PPL Park Suite Menu anyway. Within the concessions there are a number of brands run by the caterers including Black Angus Grill, Hot Dog Nation, Mozzarella’s pizza by the slice and Blue Taco. The Union Shop is housed within the northwest corner of PPL Park next to the EnergyPlus Gate. Currently we are unsure of opening times during the week however, on the day of matches it is usually opened for at least 2 hours before kick off. An exterior shot of PPL Park which just about features the club shop. 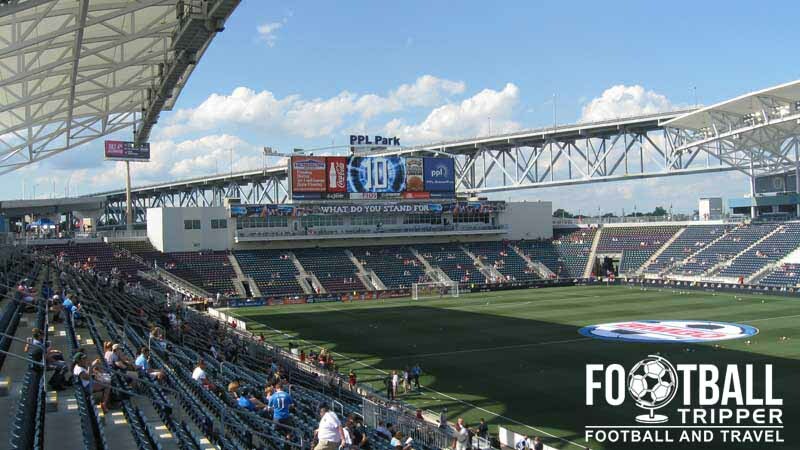 There are also two smaller kiosks selling Philly merchandise located in the southwest corner and northeast section of the concourses in addition to the Philadelphia Union Online Store. It doesn’t appear as if Philadelphia Union currently offer supporters the chance to tour the facilities at PPL Park but if this changes we’ll be sure to update this section. Tickets can either be purchased in person at the Union Box Office which is located next to the PPL Energy Plus main entrance gate or online via the official ticket vendor Evenue.net and generally range between $27.00 for the cheapest seats and $155.00 for the most expensive. 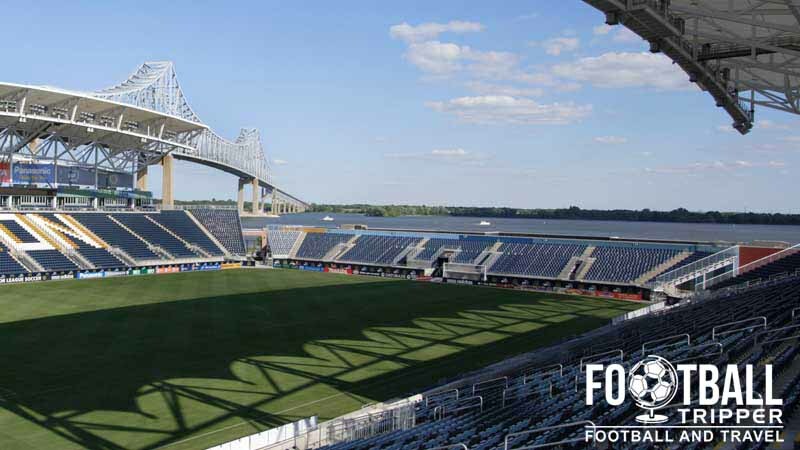 PPL Park is located on the northern bank of the Delaware River just past the Commodore Barry Bridge which separates Pennsylvania and New Jersey. The main entrance to PPL Park. 1 Stadium Drive, Chester, PA 19013, United States. Parking is available on a first-come, first-serve basis with attendants scattered around to direct drivers to unoccupied spaces. On-site parking costs $20.00 whereas off-site parking located at Edwards Lot D is slightly cheaper at around $15.00. You can stay for up to five hours on site and for four hours off-site, with charcoal barbecues prohibited although sensible tailgating is allowed. On matchdays a free shuttle service runs for up to four hours before kick-off as part of a combined train ticket. You can take the SEPTA R2 regional rail line to Chester Transportation Centre and outside on 6th and Welch Street there are departing buses which can take you to PPL park. Philadelphia Union fans standing in solidarity with their on-field brothers. After the full-time whistle has gone, the return shuttle buses will be waiting along Front Street which is to the right after you exit the main gate known as PPL EnergyPlus. The nearest hotels to PPL Park are all located in both directions on the Delaware Express way 95. To the west there is a Crowne Plaza and Star Hotel, whereas t the east there is a Best Western Plus and a Days Inn Chester Philadelphia Airport.